The title, description, and keywords are pretty standard things. They can, however, be used to set embedded SEO expansion terms on a per domain basis such as setting things to say "heating" when folks land on a heating based domain. See the SEO Checklist for details. Setting the default page is really powerful. For example, www.hotdoodle.com, hypnosis-hypnotherapy-website-design.com and lawyer-web-design.com all open to different landing pages, each talking about different things. To make these even stronger, make them be alternative landing pages with the "Becomes home page if ever visited" clicked. Browsing the above domains and clicking the Home" link takes you to the domain specific home page -- it has swapped position with the default home page. Setting the default language is also powerful. automotive-mechanic.com and mecanico-automotriz can land on the same page, but one can set that page to show its spanish content. This setting is persistent in the session. For example, these domains can land on per-langiage hand crafted designated landing pages, but set the other shared pages to show the desired language. Used together the techniques get REALLY powerful. They might land in a "heating" hand crafted alternative land page, but when they browse to the not domain specific "About" page they still get heating related block titles, seo content, meta tags, HTML title, and user visible content. 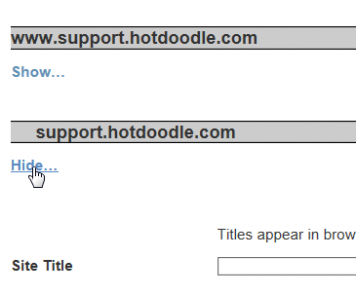 Use Show/Hide to see the properties of the desired domain. Note that "www" and non "www" are different domains as far as the web is concerned.